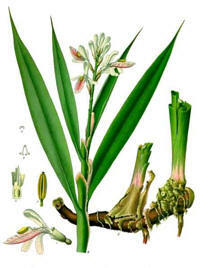 Both Alpinia galanga (greater galanga) and Alpinia officinarum (lesser galanga) are from South China. The rhizome of lesser galanga has a stronger taste. In Indonesia this spice is called laos, and that is the name by which it is known in the netherlands. In the Middle Ages this was a popular spice. It resembles ginger in taste. Not surprisingly, galanga belongs to the same family. 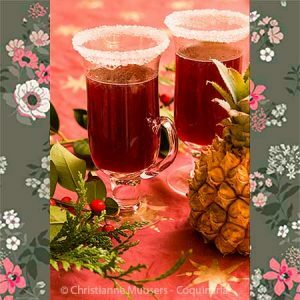 Recipes: Clareit, Medieval Xmas goose, Medieval strawberry pudding, Jacobin sops, Mulahwaja. These are green peas (Pisum sativum), but still unripe. 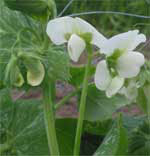 Green peas have been a food crop for at least three millennia, and were preserved by drying. They were important ingredients in soups and sauces, especially during Lent. Because their taste deteriorates quickly after picking them, the best alternative is to use deepfrozen garden pies. Canned peas are completely different from fresh peas. Recipe: Royal peas. This is an animal product. It is sold as a powder and as leaf gelatine (colourless or red). Use only colourless gelatine for jellied meat stock. Gelatine has no taste. For non-vegetarians gelatine can be used to make vegetable jellies and fish jellies. A vegetarian alternative for gelatine is agar-agar. Very important: gelatine must never boil. Disslove it in a small quantity of hot (NOT boiling!) liquid, then add it to the cooled liquid. Gelatine is used a lot in the food industry to make so called light-products palatable. Just so you know. Recipes: Meat Jelly, Pike in Galentyne. Actually I mean the Dutch version here, which is not the same as the English one. The peperkoek or ontbijtkoek that you can buy in Dutch bakeries and supermarkets is made of rye flour, honey and spices. No fat, no wheat. 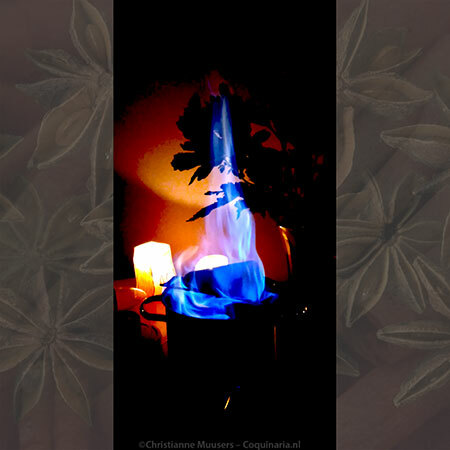 Although probably not the same thing as meant in the original recipe, it can be used as a substitute in medieval recipes. Recipe: Fake fish (medieval apple pie). You can eat gold and silver. These metals pass through your body without doing anything, either harmful of good (despite the claims of some therapies). So, why would you eat gold? Because it is expensive and glamorous of course! Practically anything can be gilded. But first you must find your gold leaf or silver leaf! In the Netherlands one place to look is shops that supply artists. You can buy “booklets”. The leafs are separated by tissue paper, and are carried by another thin sheet of paper, that you use to transfer the gold leaf, because it is so thin that they fall apart very easily. A booklet of 25 gold leafs of 8×8 centimeters cost about 25 Euro. Before you transfer the gold (or silver), make a ‘glue’ of one part egg white and four parts water, brush that on where you want the gold leaf to stick. If you want to gild on icing or frosting, only use egg white. Don’t expect a shiny result like wedding ring, to get that, you’ll have to use bolus (red earth) as base, and polish the gold afterwards. Food to gild can be anything, like the rind of a melon, christmas cakes and other festive cakes and cookies, and of course this medieval pasty. In the Middle Ages gold leaf was also used to gild the beaks of large birds or the tusks of a boar’s head. The soufflé Rothschild, a recipe from Escoffier, is made with kirschwasser in which small pieces of gold leaf float. Recipe: Turk’s Head. Gooseberries (Ribes grossularia) were not cultivated before the thirteenth century, but they are indigenous to Europe. Despite the name, geese do not eat gooseberries. Some say that gooseberries are thus called because of the great combination of gooseberry sauce with fatty meat, like that of goose or mackerel. In the North of France gooseberry sauce was a classic accompaniment to mackerel, a fatty fish (the French call the gooseberry groseille maquereau or mackerel berry). In the nineteenth century it was believed that the Dutch name kruisbes (litt. ‘cross berry’)was derived from the Finding of the True Cross on May 3rd. But the medieval names stekelbesij (‘prickly berry’) and kroeselbesij (‘curly berry’; the modern word kruisbes is derived from this) indicate that it is the hairy skin that gave the berry its Dutch name (likewise in German: Stachelbeere). Recipes: Meatballs in lettuce, Broiled fish with three sauces, Omelette with gooseberries, Sliced eggs with gooseberries. Geese are fat birds. Rendered goose fat is very tasty. You can buy rendered goose fat in cans or glass jars (expensive), but you can of course also just roast your own goose and keep the fat. That way you not only have your goose fat ‘for free’, but you’ve also had a delicious meal! If you want to keep the fat from your roasted goose, it must be trained before storing. To save goose fat you can cut off the tail fat before roasting the goose, and melt the diced fat just as you do with lard. Sometimes the fat from the roasting tin can also be used (depends on what you’ve added to the goose). Strain it well, and to get rid of any liquids that have mixed with the fat during roasting, put it in a sauce pan and let the liquids evaporate at a low temperature. According to Claudia Roden (The Book of Jewish Food ), goose fat is very healthy, comparable to olive oil. Here is a medieval recipe for roasted goose. Grain kernels are seldom used whole in food. From large to small, you have the whole kernel, then groats (broken kernels), grits (crushed kernels) and meal (ground kernels). Groats and grits can be made of wheat, oats, barley, rye, and buckwheat. In the South of the United States, grits made from corn is popular food. Bulgur is also a kind of wheat groats, but the kernels are steamed, so it does not need to be cooked, or just a few minutes at most. Recipe: Medieval bread, Kale with chestnuts and groats. If a French recipe mentions Gruyère, naturally it means French Gruyère. But -at least in the Netherlands- you hardly ever see French Gruyère, it’s almost always the Swiss cheese. And that is not so strange, because Gruyère cheese is named after the town Gruyère in West-Switzerland. The French cheeses that are produced like the Swiss Gruyère are not called Gruyère but Comté and Beaufort (or Belfort). The official French AOC (Appellation d’Origine Controlée) Gruyère is different from the Swiss one: it has holes. However, it is produced in the same region as the Comté and Beaufort cheeses. The French government has stipulated the exact size of the holes in the Gruyère cheese: “des ouvertures de dimension allant de la grosseur d’un pois à celle d’une cerise”. So, between the size of a pea and a cherry. And don’t ask me what the official size of a pea or cherry is! Recipe: Mushroom pie, Cheese biscuits.